No, these two clubs really do not like each other. 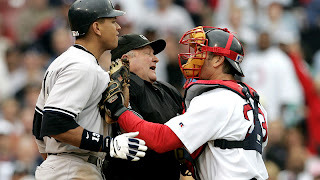 Whenever the New York Yankees and the Boston Red Sox match up, you know something is going to happen. Like baseball, for example. And so as they are playing this weekend, they are the featured game on Fox Saturday Baseball. The secondary game is White Sox-Mariners or a game that nobody gives any care about. Here are the announcers and distribution splits for the MLB on Fox this Saturday. no one cares, EXCEPT IT WAS A PERFECT GAME YOU MORON! Well of course I have to eat some crow about writing that but I had no way of knowing there would be a perfect game. Now I know not to write that again.